Fishing waders should be strong, durable and warm. They need to be tough, yet they also need to be extremely lightweight and flexible like our favorite pick the frogg toggs Neoprene Amphib. If your wader doesn’t move easily with your body, you won’t be able to wade effectively through the water. Look for a wader that can perform all of these duties and has a few added options. Some products come with convenient features, like hand warmers, gravel guards and waterproof pockets for money and car keys. Keep an eye out on the price. Just because a pair is made with quality stitching and superior materials doesn’t mean it needs to cost a fortune too. The camo chest waders are made with Realtree Max-5 material, which means you’ll have the most efficient concealment and low chance of detection. The Realtree Max-5 camo pattern is one of the best on the market for remaining undetected. The neoprene upper is 3.5 millimetres thick for added waterproofing power and less chance of rips and tears. The upper has a thick coating of polyester jersey shell. All seams are totally sealed to minimize chances of leakage. The seams have been finished with a high-end glue and are then stitched shut. An extra layer of tape is applied on top to ensure no water will make its way into your waders – keeping your dry and warm. The liner is made of jersey material, so it stretches and moves with your body. The best part of these boots is the waders. They weigh only 600 grams, so you’ll be able to move freely in most waters and mud. The Thinsulate Ultra Insulation boots are nice and thin and allow full range of movement. Yet these boots are ultra-sturdy and heavily insulated, so your feet won’t ever be cold or wet. The neoprene suspenders can be adjusted to fit nearly every height. The reinforced knee pads keep your knees free from tears or scratches that could compromise the comfort and dryness of your waders and allows for extra protection from rips and tears. One of the coolest features on these waders is the hand warmers. The chest pocket also doubles as a warmer for your hands that is lined with warm and cozy fleece. The pocket can be accessed by either hand. There’s also a storage pocket located on the upper that can keep money, credit cards or other loose items safe, secure and dry. These waders have some of the best features on the market, yet the best feature of all is their ability to keep you warm and dry. The adjustable suspenders allow these to be worn by people of varying heights. The thick, reinforced upper, boots and kneepads ensure that rips and tears won’t slow you down or get you wet. The flexible neoprene allows for comfort all day long, and the stretch jersey lining keeps you comfortable and dry. These waders were definitely made for comfort and not style, yet they are available in two styles, MAX-4 or MAX-5. Both were designed to help you blend in with the rest of the scenery. The camo pattern offers a variety of browns, blacks and tans that are applied in a swishing pattern. Even if you are moving, your camo will still keep you concealed as much as possible. Since the seams are reinforced with glue, tape, sealant and stitched, you can be sure water will never leak onto your skin. The additional features, like the fleece hand warmers and pockets, add a nice touch and make a difference on chilly days or when you need a handy place for keys or credit cards. The Frogg Toggs weigh in at only 600 grams, so you can wade around as free as possible. The light boots are made of thin and durable material to make your feet feel as if they are gliding freely through the water. These waders come in nine sizes for added comfort and fit. The straps can be adjusted to nearly any height. These waders are extremely lightweight and never fail when it comes to keeping their wearers dry. Customers also love the added attention to the craftsmanship of the stitching. Some customers feel the boots fit a little on the large size; yet the pants don’t fit correctly if the waders are ordered one size down. A few customers also felt that the shell holder doesn’t stay clipped to the Velcro closures. The Caddis Men’s Breathable Stocking Foot Waders are some of the least cumbersome waders on the market. These waters move easily with their wearers and feel like regular overalls – yet have superior water protection qualities. They come with a taupe stocking that breathes, so you never feel sweaty or uncomfortable. The adjustable suspenders can be set to nearly any height. The convenient fleece-lined pocket is perfect for keeping hands warm. These waders also come with gravel guards that are attached to the ankles to ensure that rough wading conditions never get you down. These waders are perfect for all wading conditions and weather. They are guaranteed to stay warm and toasting even in cool waters. They were created especially for fishermen. They’ll keep you dry and comfortable while clamming or in the pond. Only the highest quality material is used in the Caddis waders. All material is breathable, so you won’t feel uncomfortable or sweaty. The outer is made with a special polyester, called CaddisDry technology. This superior wader technology keeps the water out of your waders but also allows sweat to be wicked away – so you never feel wet. The boots are made to ensure water never flows into the lining through cracks or seams. The seams are closed with two layers of tape and specially stitched. They come in a large variety of sizes, so fishermen of all shapes and ages can enjoy these waders. The most distinctive feature of these waders is the CaddisDry technology that can’t be found on any other brand of waders. This special technology keeps you warm and dry – from the inside out. This technology was specially designed to keep out lake, pond and ocean water. Yet these waders also wick away sweat and allow interior moisture to escape the boot. Most waders can do one or the other but not both! These waders are some of the most subdued on the market. The simple design is perfect for fishermen. They come in two colors: green and a green and tan combination. Weighing in at 6.5 pounds, these waders are extremely lightweight. Most people feel as though they are walking on air. Fishermen love that they feel unencumbered by the lightweight material. Customers love the quality of these waders for the price. They love the lightweight materials used and that they feel as though they’re not wearing waders at all but regular overalls. Even fly fishers claim that the waders are comfortable enough for a full range of motion. They come in two colors and come with their own gravel guards. The hand warmers are efficient at keeping fingers toasty while fishing in cold weather. Some customers felt that the waders gave out after continuous use but felt that the quality was on par with the money spent. Some customers also felt the sizing was off and should be ordered a size smaller. Taller customers felt the sizing was just right and loved that they could wear the waders without sagging or adjusting the straps too much. The Allen Company Shadowgrass Glades Camouflage Wader features a jersey knit liter that’s made of nylon for total breathability. The bottom exterior is made of neoprene that has a thickness of 3.5 millimeters for uninhibited wading through ponds, streams and shallow sea waters. The suspenders can be adjusted to accommodate a variety of heights. The front and back come in a D-ring style. A web belt cinches the waist for added support and comfort. The back is cut high, so water won’t penetrate the pants. The kneepads are reinforced with extra neoprene to prevent against cuts and tears. A convenient hand warmer pocket is attached to the front of the chest for added comfort while working and fishing. The boot features a toe cap with a semi-hard toe. The arch support is made of steel for added support, comfort and durability. The rubber boots have a Thinsulate lining that weighs only 1,000 grams for added comfort and flexibility. The chest measures 47 inches. The inseam measure 34.5 inches. One of the product’s best features is the high back. Water can easily sneak into the upper of waders if the back is not high enough. The Thinsulate lining is also a huge feature since it allows for both warm and dry conditions without adding bulk or extra weight. This wader is very simple and comes in a camouflage design for blending in with the scenery. Fish cannot easily spot fishermen wearing these waders. The exterior is a green, black and brown multicolored fabric. The camo is perfect for tall grasses, ponds and shallow areas of lakes and rivers. The waders come with a one-year manufacterer’s warranty that covers all damages not due to regular wear and tear or owner accident. The entire piece only weighs 12 pounds, so you can seamlessly walk through water without heavy lifting or feeling weighed down. They come in seven sizes, so nearly everyone can enjoy wading in the water without getting wet. The Allen Company’s waders are extremely comfortable. They move and breathe with the wearer and will not weigh the wearer down. The lightweight shell is the perfect thickness for repelling water while the interior lining is stretchy and comfortable against the skin. Most customers report that the waders will keep the wearer dry for many (over seven) hours at a time. Most customers felt that the waders kept them super warm in cold waters and chilly conditions. Most customers were happily surprised that these waders passed the test on price and durability. Most customers even wore these waders season after season and found reliable year after year. Overall, customers were pleased with the insulation and comfort in cold weather. Some wearers felt the waders ran a size large (which is normal in waders) and needed to order a size smaller than they normally would. Though the waders are extremely warm, some customers felt they fared better when they wore sweat-wicking underclothes to stay dry all day long. Some customers experienced slight leaks in the crotch area, yet these incidents were few and far between. Since the manufacturer offers a warranty on all products that performed under expectation for the first year, most of the customers were able to receive replacements for the faulty waders. 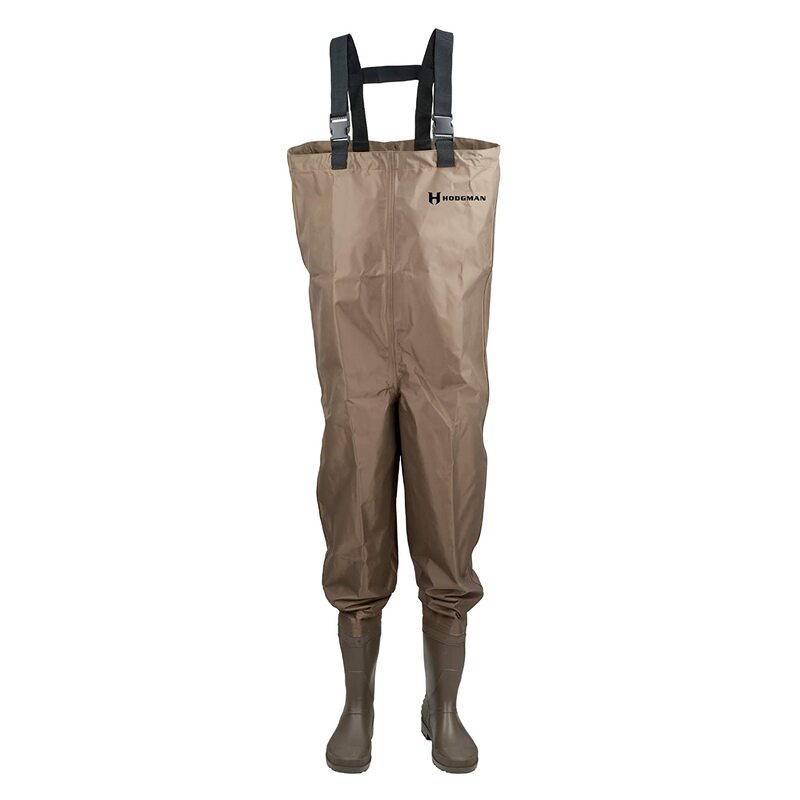 The Hodgman Mackenzie Cleated Nylon/PVC Boot wader is a great option for a budget wader. It’s 35 percent lighter than most waders made of rubber, so you’ll never need to feel weighed down in rivers, ponds or the sea. The water should be the only thing weighing down your wader. The upper shell is made of a lightweight nylon material that flows with your body as you walk through the water. Though the exterior is made of light material, these waders are extremely durable. The material can stand up to rough currents and tough elements. The boots are made of PVC which will keep your feet dry and warm in all conditions. The boots also move with your feet, so you won’t feel “weighed down” by your waders. PVC can also stand up to the elements better than rubber and is much more durable. These waders also feature an internal pocket, so you never need to worry about losing your belongings, including keys, money or credit cards. Your belongings will also stay dry thanks to the nylon lining. The best feature of these waders is their range of movement and lightweight fabric. Most customers enjoyed the flexibility of the fabric and durability of the boots. The waders come in tan with black lining and suspenders. The color allows you to blend into the scenery without being spotted by most fish. Customers enjoyed that they could wear these for extended periods in the water or comfortably sit in them too. The boots are extremely durable while still being lightweight. They come in sizes 7 to 13, so customers of every shape and size can find a comfortable fit. Most customers loved the low price point and felt the price was a fantastic deal for the quality. Customers also loved that the straps were easily adjusted to fit both tall and short men and women. The majority of customers commented that the waders were super comfortable – some of the most comfortable waters they have worn to date. The waders were even able to stand up to pulls and tugs from sticks, thorns and boulders. Yet the material was still flexible enough to move around comfortably. Some customers felt the straps slid off their shoulders easily and needed to adjust the suspenders to tightest setting. Yet most customers did not feel that the need to adjust the suspenders was a huge setback in performance. Some customers also felt that the traction on the boots was a little slippery. Some customers were disappointed that the waders did not come with exteriors pockets but still found the interior pockets helpful. River veterans tend to value the quality of the stitching and materials over all other factors. A lot of information can be gleaned from a glance at the craftsmanship in waders. Most of the waders that turned out to be fan favorites had superior stitching, extras layers of coating materials and several layers of glue or tape to seal the seams. Products that did not receive good customer reviews often leaked on the first use or showed signs of poor craftsmanship. Most of the positively rated waders also had high backs and additional features, like hand warmers and pockets. Other features that added to the craftsmanship and overall value of the waders included gravel guards and reliable closures and clasps. Seasoned fisherman also consider a warm lining to be an important factor in a quality wader. High-quality waders should have plenty of features that add to the warmth of the product. Most waders that tested positively had a warm liner and a lightweight and waterproof exterior shell. These waders could usually be worn for extended time periods (more than five hours and sometimes up to 10 hours) and moved easily with the wearer. Waders that did not receive good reviews often leaked within the first wear and did not keep the customer dry. Others complained that the lining was not warm enough to stay in the water for extended time periods; if you can’t remain in the water for more than five hours, you won’t be happy with your wader. Even lightweight waders should offer some type of warmth for extended periods of time. A superior wader should also offer moisture wicking materials. Even if the exterior shell can repel water, the product is worthless if the interior becomes drenched with sweat. Try to find a wader that offers a soft and stretchy lining that can form to fit your body type. The lining should also be able to wick away sweat and not absorb moisture. Many customers who were unhappy with their waders complained that they became cold because the interior material allowed sweat and moisture to cling to skin and the inside of the wader. The exterior material won’t matter if you are drenched in sweat because your boot cannot wick away moisture. All the waders listed here are extremely lightweight – even though most offer plenty of durability and warmth. Try to choose a wader that doesn’t weigh more than 15 pounds otherwise you risk feeling bogged down and fatigued after a short while on the river. If you’re struggling to walk in your waders, you won’t want to wear them in the water. Most customers were happy with the weight and flexibility with the waders on this list. Though you want your wader to be able to stand up to tough conditions like extreme weather and rocky landscapes, you won’t be able to wear your waders for extended periods of time if you don’t have normal range of movement. Choose a wader that can stand up to the elements and is durable – yet don’t forget to factor in comfort too. The waders that keep customers warm and dry tend to be the most popular on the market. Yet the waders that sprung leaks in the first few uses did not receive good reviews. Try to find a wader that is easy to walk in too. If you can’t move around easily or don’t have a full range of motion, your wader won’t be comfortable; you won’t want to spend time your waders and you won’t want to spend time in the water. Though price can affect the quality of the wader, most customers were as happy with the budget option as they were with the most expensive option. If you need a wader that will keep you extremely warm, consider paying a little extra for one of the high-end versions. While the budget option received great reviews, it wasn’t created for extremely cold conditions. You might be happier in one of the more expensive options and will spend less money overall by spending a little more off the bat. Almost all the options listed here offered hand warmers and pockets, and most customers enjoyed these small touches.